The conference will be held in Rochester, MN on September 17 and 18, 2019. Sessions should meet the professional and personal development needs of a diverse audience, including people new to the work, experienced professionals, and people experiencing housing and economic insecurity. 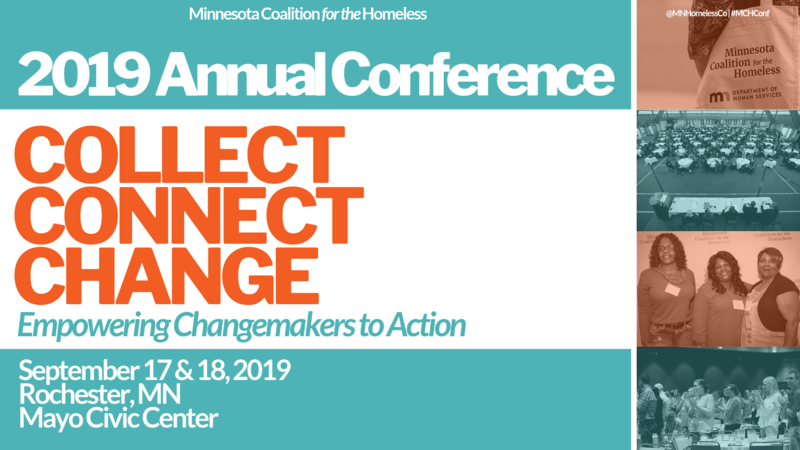 The MCH 2019 conference will focus on connecting Minnesotans from across the housing sector to create collective change. When we educate ourselves and connect with the incredible work around us, we have the capacity to implement strategic and innovative solutions. Only together will we develop a more equitable and effective model for housing stability and economic security. How can we use collective knowledge and best practices to push for greater investments along the housing continuum? Where will our partnerships lead us? In what ways will we ensure that every aspect of our work is shaped by a racial equity lens? How has your community connected and collaborated to find solutions to local issues? Minnesota’s collective efforts to end homelessness are unique in the nation. Together, we have built cross-sector, bipartisan partnerships that have changed the narrative about homelessness and led to strategic, targeted investments in affordable housing. MCH supports and defends legislation that protects resources utilized by low-wealth and under-resourced communities, including communities of color and/or Indigenous communities. Our advocacy strives to create collective change through connecting Minnesotans and statewide resources--we will not stop until everyone has a place to call home. All workshop proposals are welcome and will be considered. We will give special attention to those that align with the central theme of this year’s conference: Collect, Connect, Change: Empowering Changemakers to Action. We will also give preference to presenters who identify as POCI and/or LGBTQ+.